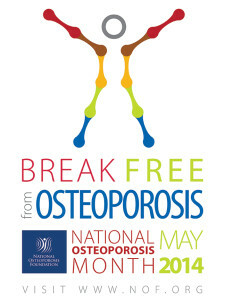 May is National Osteoporosis Month and we are here to help you and/or your family members break free from osteoporosis. According to the National Osteoporosis Foundation about half of all women and 25% of men over 50 will break a bone due to osteoporosis at some point in their lifetime. About 1.5 million men and 7.5 million women in the US have osteoporosis and 52 million Americans have low bone density termed osteopenia. Osteoporosis is a major problem for older women and men in America and if we do not increase awareness about prevention these numbers will continue to rise. Osteoporosis is a disease of bone that is caused by loosing too much bone, making too little bone, or both. The result is bone that is too weak to support our body and can fracture easily. Read this post for a greater description of osteoporotic bone. Osteoporosis can be a serious condition that results in life threatening injuries. While we are younger, breaking a bone, is typically not life threatening but in an older person it most certainly can be. An older adult that breaks a bone can find their mobility dramatically decreased even after healing has taken place. Lack of physical mobility has a significant impact on our entire health. Additionally some older adults that require surgery after a broken bone develop pneumonia while recovering in the hospital and die because they do not have a healthy immune system. The cost of Osteoporosis is high. Presently osteoporosis is responsible for 2 million broken bones and 19.2 billion dollars in related costs. It is predicted that by 2025 osteoporosis will be responsible for 3 million fractures and 25.3 billion dollars in related costs. We can impact these numbers by increasing our understanding on osteoporosis and engaging in lifestyle modifications to avoid and treat it as we age. Stay tuned this month for additional osteoporosis facts and prevention and treatment strategies. With the BStrong4Life program at our office we have the unique ability to effectively treat osteoporosis and it only takes a minimum of 15 minutes a week. Check out some video testimonials here.